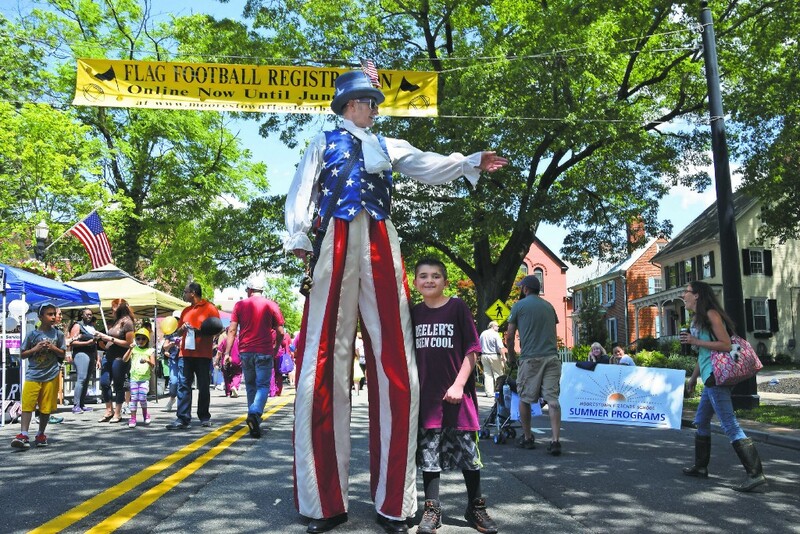 The 42nd Annual Festival returns on Saturday, June 2 from 9 a.m. to 4 p.m.
Woody Duncan (left) dressed as Uncle Sam on stilts to serenade those in attendance at Moorestown Day last year. Christian Carbanaro, age 12 of Marlton, looks on and laughs at the two enjoy the festivities on Main Street in Moorestown. For one day, Moorestown’s Main Street will shut down as thousands of people converge to celebrate a township tradition. The 42nd Annual Moorestown Day Festival presented by the Moorestown Business Association will take place on Saturday, June 2, from 9 a.m. to 4 p.m. with more than 300 vendors lining the town’s main thoroughfare. Attendees can expect food, live music, merchants and a variety of other entertainment. The corner of Chester Avenue and Main Street will feature a “Kid’s Zone” with inflatables, a petting zoo, games, face painters, a balloon artist and a stilt walker. Andrew Mackerer, the MBA’s chair for Moorestown Day, said the day will showcase what Moorestown has to offer in terms of the business community, nonprofits, crafters and restaurants. He said the MBA begins to prepare for Moorestown Day months in advance. He said from coordinating with the Moorestown Township Police Department to close down the street to getting the word out to MBA members and the wider community, coordinating the day’s festivities is no small feat. New to Moorestown Day this year, the MBA will showcase its spotlight award winners. Mackerer said the businesses that were recognized by the MBA this year will have that designation on their booth. MBA President Steven Pazienza said they hesitate to change Moorestown Day too much each year. He said people come to expect a certain degree of tradition, and so they strive to bring back many of the same highlights that have made the festival a success year after year. “It’s really taken on a life of its own,” Pazienza said. For many, the festival is a day to socialize with neighbors, Pazienza said. He said he’s often heard it can take up to an hour to walk down Main Street on Moorestown Day just because so many residents find themselves stopping to talk with friends and neighbors. Pazienza said many of the businesses in town get their start on Moorestown Day. He said with so many people in one area, it’s a great way to get their name out. He said not only is it a day for businesses, however, but nonprofits, students and artists all utilize the day to get exposure for their work. Lincoln Technical Institute will provide free parking and shuttle services throughout the day. Festival-goers can park in its lot at 308 W. Route 38, and buses will drop attendees at Main Street.